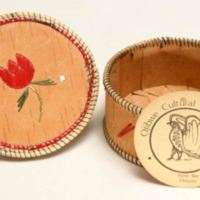 Elinor and Vincent Ostrom found themselves drawn to the beautiful stories told through Ojibwe arts. 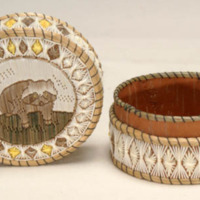 They collected prints and birch bark boxes that tell tales with histories that live beyond the art gallery or souvenir shop. 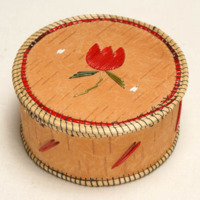 Aadsookaan (ad-zoo-ka-nan) are the traditional stories of the Ojibwe of Manitoulin Island. Those stories, passed down orally and later through text, shine through in this exhibition’s art. 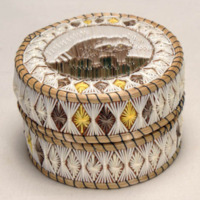 Animal imagery represents the Island’s wildlife, and tells stories of those animals’ personalities, interactions, and spirits. 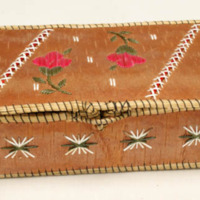 Even the wiigwaasimakokoon, (wig-wa-sim-a-ka-koon) the birch bark boxes, tell stories. 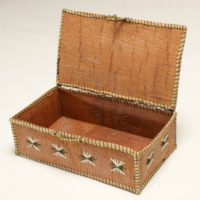 Though they do not all include images of wildlife, the materials themselves—birch bark, porcupine quills, and sweet grass—play roles in stories and in the traditional spiritual world of the Ojibwe.